Andrew and I have a holy hour together on Wednesday nights. Tonight I read from the book I am working on: Difficulties in Mental Prayer. This book is loaded with insightful tidbits about prayer and struggles that come with seeking a relationship with Christ. Sometimes... ok let's be honest, most of the time I have difficulties in acknowledging Christ's presence throughout my day. 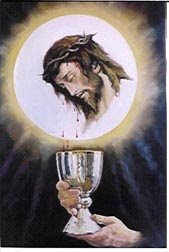 Also when I am at Mass or at my holy hour, I have a hard time really focusing on Christ's presence in the Eucharist. I do believe he is present, but more with my head and less with my heart. Comparatively, during most of the day I do not really think about the baby growing inside me. I am so busy that he becomes an afterthought. It is really only his kicking that draws my attention back to recognizing that I have a little man growing inside me. As I sat before the Blessed Sacrament tonight, I stared at my stomach and tried to imagine him being inside there. All I could see was a big belly! It was so hard for me to contemplate his life--Just like it is hard for me to imagine Jesus being with me always and being present in the Eucharist. It is amazing that I have been sharing my body with Baby St.Hilaire for a full 5 months now. I am really honored to do it! And in a short while his life will be revealed to me in his birth. Then I will really know he is there and I won't be able to forget about him during the day. I hope at some point in my life, Christ's presence will be revealed to me also. I never want Christ to be an afterthought in my day, or just someone I speak briefly to. I want my relationship with Him to be real, one filled with true friendship and love. As it turns out, both sets of parents were able to come as well, and so it was like a family reunion! We only got to see Lindsey for a brief minute, but it was great to know we were all there united for a cause so dear; a cause through which God ultimately brought our families together. The St.Hilaire's and Stockton's joined an estimated 7,000 people on the steps of the capitol building -- an unprecedented amount. Prior to the March was the Mass for Life at St. Michael's. Bishop Tyson celebrated, with around 30 priests from the Archdiocese concelebrating, including our beloved Fr. Qui-Thac Nguyen. There were nearly 1,400 people at the Mass. Okay, it is time for me to post some belly pictures. These were taken on January 7th, when we were 23 weeks along. Now we are approaching 25! I feel our little boy more and more each day! I have loved getting to know him in-utero. We think he does some kind of aerobics around 9pm and he likes to stick his bottom out (or maybe it's his head) so there is a little hard bump in my lower belly. But, I can't wait to hold him in my arms. Andrew and I are trying to just enjoy our precious time together before our son comes out. We are so eager for him, but we know our lives and our relationship will change a lot when he is out. I recently saw this video and thought it was really well done. Last weekend we made a trip to Kennewick for our consins' Ben & Angele's wedding reception. Angele is from Texas, so the wedding was actually in Dallas a couple days after Christmas. They held a reception last weekend, however, for us West Coasters. My parents were kind enough to give us kids a ride. It was a tight, but cozy 3 1/2 hour ride, with my parents, Lou and Jenna, and Lindsey and me all packed in the Buick. Dad had the burden of driving under the threat of ice and snow over the pass. We were blessed to have a clear and dry path all the way over and back, however. I'm confident Our Lady was watching over us. Ben and Angele make a wonderful and holy couple. We're excited for their marriage and look forward to many "cousin exchanges" in the future! Here's Dad with baby Paul, son of our cousins Tommy and Peggy. Angele with my cousin Maria. I've been long meaning to post some pictures that we've accumulated since Christmas. So here we go, I'll start with some pictures from Christmas and New Years. Although we had planned to be in Newport, OR for Christmas, we ended up being snowed in at the Firehouse in Bremerton, which turned out to be such a memorable time. This was my first time decorating a tree away from Bellingham. We Celebrated Lindsey's 24th birthday! We had dinner with my parents' neighbors and good friends, Linda and Skip. We were able to celebrate the New Year at the Xavier House! It was a great being able to spend some quality time with our dearly-missed friends from Bellingham. We taught them a dice game called Fill or Bust. Andrew had the good fortune of getting the "No Dice" (skip a turn) card 11 times in two games. Poor guy. We had our final ultrasound yesterday. Over a month ago, when we had the second ultrasound, it was too early in our baby's development to tell the gender. The ultrasound technitician placed his bets on boy, but was uncertain. He invited us to come back a month later when it would be easier to tell, free of charge! And there's not doubt now -- we have a son! It was kind of a beautiful moment. Once again Mom and Dad Stockton were able to join us. There we were seeing our son (and grandson) probably for the last time, before he's born. In that brief time I realized how much I desire to hold, bond with and grow in love with our child. I recognize this time is precious for Lindsey and me, as we embark upon the life-changing period of having a newborn baby, and God-willing, many children thereafter. But still, it's as though I'm waiting impatiently at the window for a package which I know is coming in the mail! Well, here I am sitting down to blog--when I should be cleaning my desk and planning lessons for the first week back to school. Andrew keeps reminding me that I should blog. If I don't do it now, it may never get done. Christmas was a true blessing. As I mentioned in a few posts back, we were snowed in at my parent's house for about a week. It was really fun and forced us to be focused on good family time together. We played a lot of games (a favorite Stockton family pastime! ), put together a puzzle, ate a lot of yummy food, and journeyed out to Mass a couple of times. I wasted a lot of time playing a game on Andrew's iPod Touch called "Fuzzle." I played it so much that it has become a verb: "I think I'll fuzzle for a while" or "I can't do that now, I'm too busy fuzzling!" I taught my mom how to fuzzle, which caught the interest of my dad. Now, they are both addicted. Fortunately, they downloaded the free trial, so their score maxes out at 400 points. As I said, I have wasted much time fuzzling, and it did not help that my brother beat my high score by leaps and bounds. I have spent the last week trying to beat him. A couple of days ago, I reclaimed my position for having the highest score on Andrew's iPod. Now my life can go on! We went up to Bellingham on December 27th after a brief visit with my mom's extended family at our annual family Christmas party. In Bellingham, we were able to visit with our (Andrew's) cousins Erin, Bill, and their daughter Sydney. It was really nice to see them and visit. They were at our wedding, but we did not have much quality time with them. Being with Mom and Dad St.Hilaire was such a treat! We have not been able to spend a lot of time with them over the past few months. And our visits are usually pretty short. We were able to stay in Bellingham for a little less than a week. As the end drew near, Andrew reflected that it was a full week. Pretty much every night we had something going on; either delicious food to eat, fantastic company, or fun games (or all three)! We brought a few games up and taught the folks and Lou and Jenna how to play them. One of the best gifts we received for Christmas was from Mom St.Hilaire. She gave us our own "friendship table cloth". The St.Hilaires have a tradition that whenever guests are over for a meal, they sign their names and date on the "friendship table cloth". Then Mom embroiders over the signature. Their table cloth is very full the names of all the people who have visited them over the years. It is difficult to find an empty spot! At our rehearsal dinner Mom had a blank table cloth out for everyone to sign. She has spent the past few months since the weddings embroidering all of the signatures (for us and Lou and Jenna). She gave us the table cloth for Christmas. It is ready to be filled with the names of all our future guests. We are so honored to carry on this beautiful St.Hilaire tradition in our own home! So when you come to dine with us, guess what you will see on our table? Yesterday, I was paying bills and found myself writing 2009 on the checks. Holy cow- is it really 2009 already?! This year will bring many changes for us. Changes we are looking forward to, but changes that will really stretch us. The first (and biggest) change will happen when Baby St.Hilaire comes out. As Andrew told me, we will need to be less focused our ourselves once our baby is born. Another change is I will be done with teaching and taking night classes in April. In July we will be moving out of our house and into one of the apartments in my parent's house. In the fall I will need to do student teaching and thus leave our baby with his grandma during the days (this will probably be most hard on me!). Andrew will continue working with Swingsetmall.com and growing in his business skills. Yes, we will be very busy in 2009! We hope you are all doing well!